I wonder how Babe Ruth, Lou Gehrig, and Joe DiMaggio would feel if they could see this. I guess the Yankees are planning to build more scaffolding and dismantle it slowly? I have no idea, and I don’t even care. I’m just glad/sad to have seen it firsthand. Here’s a photo (taken from the Metro-North station) that shows the shadow of the big bat on the rubble…. If you click the photo above to make it bigger, you’ll see a fan wearing a red shirt four rows in front of me. That was a 14-year-old ballhawk named Connor, whom you might remember from 4/18/09 at Yankee Stadium. Yesterday, he and I often found ourselves in the same section, but we did a good job of staying out of each other’s way. In case you can’t tell, the ball flew over my head and landed in the tunnel. I’m always concerned that I’m gonna get shut out at Yankee Stadium, so it felt good to get that first ball out of the way. As it turned out, that was the only ball I snagged until the Angels took the field. Not good. But it wasn’t like I was dropping balls or misplaying them. There just weren’t many opportunities. Now, let me just state for the record that I really do like the Angels. I worked as an unpaid intern for one of their minor league affiliates in 1995 — the Boise Hawks — and it was the best summer of my life. Among the many awesome things that happened, the Hawks ended up winning the Northwest League championship, and I was unexpectedly given a championship ring. It’s one of my most prized possessions, baseball or otherwise, so I’ve always rooted for the Angels as a result. That said, I’ve taken some heat from Yankee fans for wearing visiting teams’ gear in the Bronx, so I want to make it very clear that on this particular occasion, I did it for a personal reason. No disrespect intended. It was thrown by Angels catcher Bobby Wilson after he finished warming up along the left field foul line. Ready for some more action shots? Don’t feel bad for Connor. He ended up snagging a few baseballs of his own, and I’ll let him tell you about it himself in the comments. BP ended shortly after that, so I raced through the seats and made it to 3rd base dugout just as the Angels were coming off the field. (I couldn’t get all the way down to the dugout. I had to stay half a dozen rows back.) First base coach Alfredo Griffin tossed a bunch of balls into the crowd. I got one of them. It was my eighth ball of the day, tying my personal new Yankee Stadium record. There was SO much room to run, and on top of that, the left-handed Scott Kazmir was pitching for the Angels, so the Yankees’ lineup was stacked with righties. The good news is that there were four home runs (two by Robinson Cano, one by Hideki Matsui, and another by Derek Jeter). The bad news is that they all went to right field. …but didn’t get anything else. I did however, give away one of my baseballs to a little kid sitting directly behind me. He was so happy that he couldn’t stop playing with it. At one point, when the ball slipped out of his glove and nearly rolled under my seat, I joked, “Hey, look what I found!” and his parents laughed. Time out for a moment. Do you notice the uniform number of the pitcher in the photo above? Did you notice the uniform number of the left fielder two photos before that? Yep, it was Jackie Robinson Day, so everyone was wearing No. 42 in his honor. My rosters were basically useless as a result, but I’m not complaining. Believe me. I’m just pointing out one silly/related detail. Okay, time in. The game itself was interminable. Kazmir threw 87 pitches in four-plus innings, while Yankees starter Phil Hughes threw 108 in five-plus. Then the bullpens continued the trend of inefficiency. I wouldn’t have minded except it got really cold, and Jona’s allergies were killing her — but we stayed and watched Mariano Rivera bail out Joba Chamberlain with a one-out save. Final score: Yankees 6, Angels 2. • 23 balls in 2 games this season = 11.5 balls per game. Well, I guess you needed to have some sort of closure with the old stadium. At least you got it out of the way early in the season. Nice game too, 8 balls is good considering the circumstances. Just wait until you go back to Camden, then you can really pad your stats! sad to see old yankee stadium go. I’d been there plenty of times but never really acknowledged it’s greatness. Man, tearing it down makes me hate the yankees only more. Hey Zack, went to the Wednesday afternoon game with my brother Joe (posts on here as Milton157) and we both actually matched your Yanks BP total: a big, fat 1 ball each (he got a toss from Hughes and then I snagged a Tex HR that landed and got wedged in a folded up seat cushion). Agree on the lameness of the 2 hour gate opening – Weds was the same as what you got on Thurs – 20 min of Yankees BP, with literally only 3 balls making it to the seats (the “Bronx Bunters”!) and probably 4 tosses (so considering that we got 2 of those 7 balls, I guess that’s pretty good). This was my first game back at the new YS since last June (vs. the Mets, the Castillo “drop” game) and absolutely, to see the old cathedral looking like it does, I shed a tear. Was hoping to see some commemorative balls (like you were seeing over at Citi last week) but they’re probably all on sale at steinersports.com for 3 easy installments of $79. On another note, just finished reading Golenbock’s Steinbrenner bio “George”. In there he says that the Yanks take home $200 mil a year just from the YES Network ALONE!!! At that rate, their payroll should be closer to $300 mil. Carl Crawford, here we come! 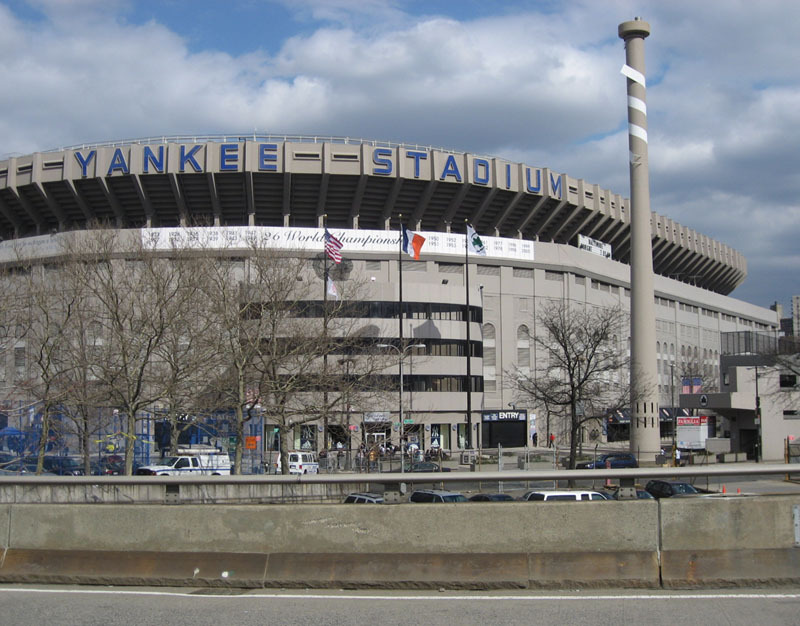 Great pics of Yankee Stadium. I am glad unlike Europe, we in America destroy old buildings and history. Watch a historic stadium go down in Texas!!!! I’m glad you still like the Angels! I too worked in the Angels minor league system, but I can’t exactly tell you what I did since it’s super secret. Let’s just say I dressed up as a giant red owl and proceeded to be harassed by children for 9 innings a game. Yes, I was the mascot for the Angels rookie league team the Orem Owlz. Sure was a blast….until the parents got settled in and let their evil children roam around, following me and making my life a living hell. Unfortunately for me, the Owlz won the title the year before I was the mascot and the year after, so no ring for me. Anyways, GO ANGELS! Great first game at Yankee Stadium zack. Its a shame to see the old one go down. I was at the game the day after you went so seeing the old Stadium the way it looked was just undescribeable. I too hate the fact that the stadium opens only 2 hours early. I’ve heard that Citi field opens an extra half hour early on saturday and sunday if you have season tix so if you buy tix from a season ticket holder you can get in earlier. I snagged one ball during BP against the Rangers. Between the packed seats and minimal opportunities, it just maks BP at yankee stadium difficult. Wow. I only attended one game at the old stadium, but that makes me sick to see that. Well great snagging considering the circumstances!! Good day Zack! Did Rivera get the save because the tying run was on deck? I read Watching Baseball Smarter. Well, the way things are going right now with the book, there’s no telling when I’ll make it to Camden. Anyway, thanks. The old stadium had lots of flaws, but you know what? That gave it character — and that’s something that the new stadium will never have. There’s one difference between the Mets and Yankees. The Mets put their extra commemorative balls into the BP bucket for the fans to enjoy. The Yankees? Yeah. Anyway, congrats on the balls you guys snagged. Awesome interview. That kid is slick! Well said. You nailed it. Hope to see you soon, although I probably won’t be back at Yankee Stadium for a while. Funny. Did you get to know Tom Kotchman? Was he managing the team when you were there? He was managing in Boise when I was there, and his 12-year-old son, Casey, would sometimes take BP after the games. The kid had NO power — I could seriously hit the ball three times as far when I was 12 — but he had a sweet swing. Thanks, and yes, it’s all rather unfortunate. Well, if it makes YOU sick, you can imagine how it makes me feel. Thanks, but I can’t use them. Yup, that’s exactly it. Good call. Glad to know that the book came in handy. (1) Nice leaning apart pict. (2) I always enjoy the entries when you represent with the sweet piece of Rawlings leather. Good job. (3) Nice job on the two handed catches. Take note of that, kids. Fundamentals. (4) Nice dirt/grass smudge pictures. I’m pretty sure you have the best baseball photography skills on MLBlogs. You always get crystal clear close-ups, which is hard. So, on Opening Day I heard/knew that the QB of the San Diego Chargers, Phillip Rivers, was going to throw out the first pitch. My plan was to get down right on the tunnel where Phillip would be exiting the field after the first pitch on Opening Day……with the Opening Day ball. I was wearing my Phillip Rivers #17 Chargers jersey and thought he would think I was a superfan of his and give me the ball when I asked for it. Everything went as planned, but he said…..”I’m going to keep it, sorry.” Rats. So close. Anyway, I tried. Talk to you later. How sad is this? Because I work the midnight shift I don’t go to day games. I’m sleeping then. At today’s game, my seatmate Kathleen caught BOTH home runs hit today. TWO in one game. Ugggh. The worst part was when she said, “You would have totally had both of them.” Ouch. Anyway, good for her. I need to get on the board…….and start going to some day games. Take it easy. I see the Old stadium every single day on my way home from work. It breaks my heart. 2) I brought it because the glove trick is basically unusable in the Bronx. 3) Even Ryan Howard does it on routine throws across the diamond. Pretty sweet plan with the Opening Day ball. Sorry it didn’t work out. As for your other comment, I cringed (on your behalf), but what are you saying…that a *woman* snagged two game home runs in one game? Not being sexist — there just aren’t many female ballhawks.